Ukrainian President Petro Poroshenko has said that every state authority in Ukraine should see work towards the country being granted a visa-free regime with the European Union as a priority. "All the tasks we've got and our plans include are absolutely clear and concrete," he said at a meeting on the fulfillment by Ukraine of the European Commission's recommendations for introducing a visa-free regime with the European Union, the presidential press service reported on Tuesday. The president demanded that an update on the fulfillment of the recommendations should be prepared by August 17. "The implementation of the plan requires accurate and well-coordinated efforts by the government, the Verkhovna Rada, sectorial agencies and the National Security and Defense Council to adopt and introduce a number of laws. The president stressed that the lion's share of these problems could be solved even during the parliament's current session," the press service said. According to Poroshenko, attention must be paid to priority issues such as creating models of primary identification of natural persons and integrated border management which foresees checkpoints being included in the Interpol database; a package solution to the issue of improving living conditions for migrants and refugees, and the development of a single approach on reforming law enforcement agencies. He expressed hope that the Verkhovna Rada of Ukraine would adopt a number of laws amending laws on prosecution agencies, the national police and law enforcement reform this week. 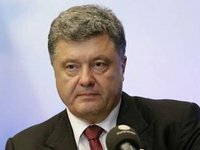 "I'd like that together with the SBU [Security Service of Ukraine] as much attention as possible was paid to the introduction of statuary regulation in the sphere of witness protection," Poroshenko told Interior Minister Arsen Avakov, noting that the system was required for the specialized anti-corruption prosecution agency to work efficiently. According to the press service, Poroshenko gave the order to launch the National Anti-Corruption Bureau, the National Agency on Corruption Prevention and the specialized anti-corruption prosecution agency as soon as possible. The President also positively assessed the dismissal of Chairman of the State Migration Service and said an experienced expert would be soon appointed to the position. Poroshenko said he expects a strategic vision of state migration policy development and enhancement of the functional capabilities of the State Migration Service in uncovering and battling illegal migration and efficient cooperation with the relevant agencies of EU member states. The participants of the meeting included Prime Minister Arseniy Yatseniuk, National Security and Defense Council of Ukraine Secretary Oleksandr Turchynov. Deputy Head of the Presidential Administration of Ukraine Dmitry Shymkiv, Head of the Border Guard Service Viktor Nazarenko, Interior Minister Arsen Avakov, Justice Minister Pavlo Petrenko, Social Policy Minister Pavlo Rozenko, deputy ministers and deputy prosecutor generals, as well as Chairman of the National Anti-Corruption Bureau Artem Sytnyk.